I picked this bath bomb up last week when I was shopping with my mum and sister. 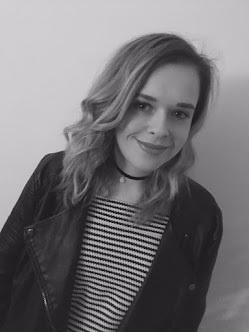 My sister, like me, is a huge fan of Lush products especially their bath bombs! She mentioned she had been meaning to try the Frozen bath bomb as she hadn't managed to get herself one yet but had heard it was a fairly new product. I did a Lush haul a few months ago so I hadn't been into Lush in a while, so I hadn't managed to try this one either. 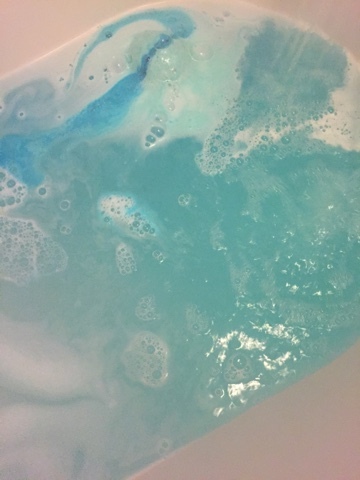 This was this the first time I had heard of this bath bomb; it's called Frozen, it's blue and it's from Lush... I knew I had to pick it up and try it out. It was previously an Oxford Street exclusive but it is now available in most stores and online. I treated myself to this after a long day, as there is nothing better than finishing off your day with a hot bath, a bath bomb and some bubbles. I find it really relaxing and it helps me wind down. I wasn't too sure what to expect from the bath bomb as I hadn't heard anything about it. I was surprised that I had found a bath bomb which I had read no blogs about. When I dropped it in the water and 'let it go'...get it?, it started swirling around and the water went a glittery blue colour with different shades of blue. After the bomb had finished swirling it left lots of bubbles, which I LOVE. The bath bomb contains grapefruit, so my skin felt soft after and the scent leaves you feeling refreshed and calm. I think if you do have baths in the morning this might be a great one to try out as the citrus scent can also provide an uplifting effect, so might be the perfect way to start your day. 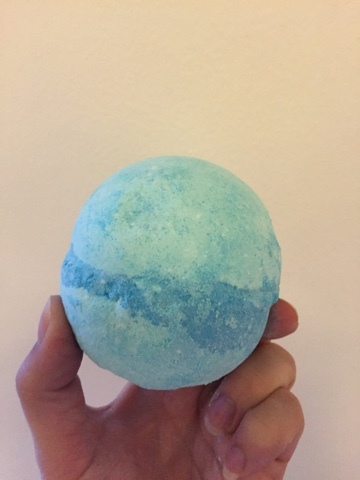 I have had a few bath bombs where there is an explosion and then your water goes a funny colour, but I think with this one it lasts a lot longer, because of the glitter and the bubbles! I think this would would be good if you were planning a long soak in the tub as I didn't want to get out of the bath... So be warned when you drop this into your bath you might be a while! oooo this sounds amazing i do love citrus scents! such a pretty colour to!